I received a new platform bird feeder for Christmas which is squirrel resistant. When a squirrel lands on it their weight forces the grids down and they are unable to get at the sunflower seeds. So far only the chickadees come to it. It is also nice to have a roof to keep the snow off the seed. We have a few other handing platform feeders- one small one had 8 pigeons trying to hang on to it. The drawing that came with this feeder shows blue jays and cardinals at it too but so far the blue jays have not tried it out. 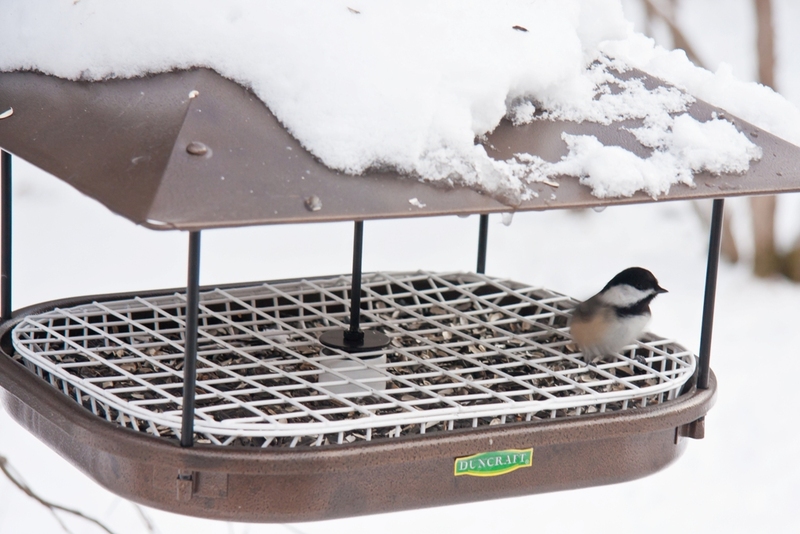 This morning the cold temperatures brought lots of birds to our feeders. I could only watch for awhile before work but in addition to the usual Blue Jays, Rock Pigeons and Mourning Doves were 2 Robins (at the Mountain Ash berries) and several Starlings. We have never had robins in our garden during the winter.